What should we read into bookshelf wallpaper? I went to a fancy middle class holiday camp the other week. You know the ones. It was fabulous. We did fencing, crossbows, rode Segways and swam every day in a giant sub tropical paradise dome like we were living in a 1970s future world of wholesomeness. Our wooden chalet in the woods had a games room, equipped with a mini billiards table, chessboard, and a gaming console that could also play dvds. There were big bean bags to lie around on. There was even a real fire place. 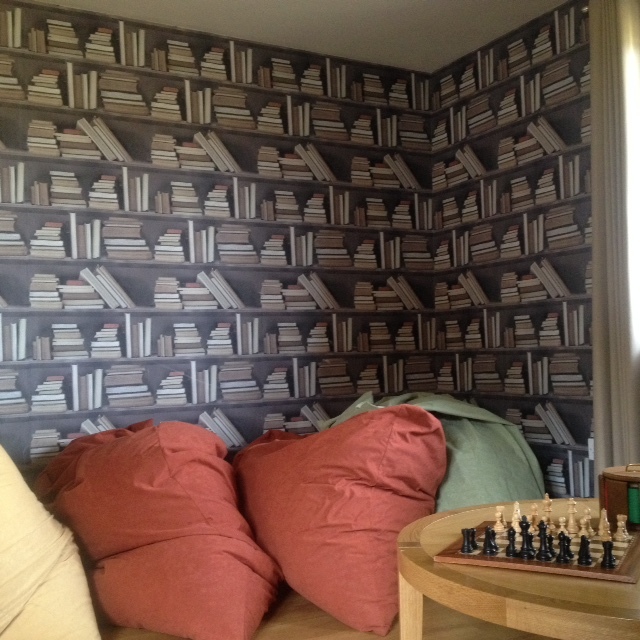 But the walls of the games room were covered with wallpaper of fake bookshelves with piles of old books to replicate something that was naggingly missing. I am fascinated by the growing ubiquity of fake bookshelf wallpaper. 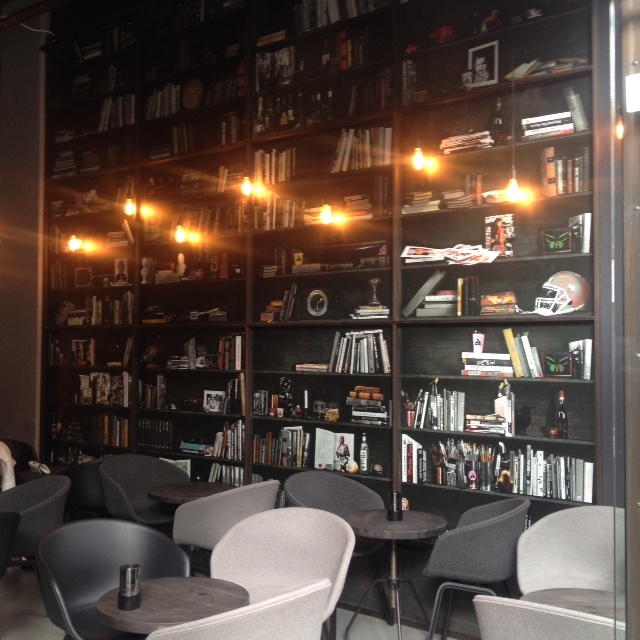 I’ve seen it line coffeehouses and hotel work spaces for guests. At the same time I’ve seen a private club advert promise a “bespoke” library for its luxury membership price. With actual old books. As a kid of the Atari age (I still have my first Pong game if you can find me an analogue monitor to plug it into) I feel no instinctive distrust of digital technology. This spring I had floor to ceiling bookshelves made for the 4 walls of an entire room. I felt childishly excited and a grownup at the same time. Sometimes I carry such ludicrous sized review hardbacks around for work I worry they’re like dinosaurs – a Darwinian extinction is inevitable. My unease is genuine. I love them. Why does it feel to me like physical books (and the concentration their use requires) are being fetishized and threatened at the same time? If you go to the Roundhouse in London this summer, you’ll see books used with real power in Penny Woolcock’s amazing “Utopia” installation. 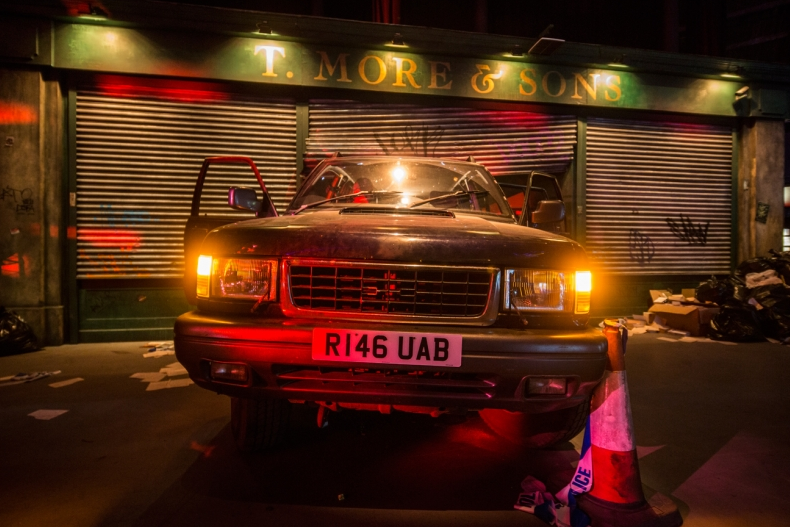 Inspired by Thomas More’s book of a future world, she’s created an urban dystopian theme park. An unashamedly left wing, political version of Disneyland’s Haunted Mansion. A jeep has ramraided the “T. More bookseller” and piles of real books are spilling out the back, and falling off shelves inside. Projected voices of real young men and women who’ve fallen foul of the law, often born to drug addicted or violent parents, speak of how books have changed them. One discovered Plato’s Republic while in prison. Woolcock told me, aware of the irony, how they had to buy books by the yard to furnish the set. Browsing them is a delight. Among them are loads of remaindered massmarket hardbacks missing dustjackets: Danielle Steele, James Patterson, Dean Koontz. The kind of authors who get sneered at in highbrow news reviews. But who are read voraciously by millions of readers who love reading. I have no snobbery about that. I once met a Lebanese SF novelist who had been given Doctor Who paperbacks as a child. She didn’t know about the TV series, just read them as adventures of this interesting character and look where it took her. In, the market house in my local town, made over for vintage style craft sellers, one stall holder sells handbags made out of just such cheap and cheerful hardbacks. They’ve ripped all the pages out and sewed up the sides with cloth, fixing chain handles over the top. I can’t object logically. It is a kind of recycling. Yet like vinyl records warped into bowls, or album sleeves and blown up orange Penguin covers mounted as art, I feel an instinctive revulsion. See also the Cath Kidston window display featuring books with ripped off covers and titles; possibly remaindered and heading for the dump anyway, but still mutilated. Like those London shell buildings I’ve watched over the decades – cleared of civic services or industry or annoying poor tenants – with their innards ripped out to be remade as hollow symbols of luxury living or business. The Shoe Factory, The School House, trading on the civic pride, industry and philanthropy in many cases that built them. In the 70s & 80s adults sneered at a lot of books teens read. Choose Your Own Adventures or cash-in film novelisations. I have still only read, never seen 1977’s The Incredible Melting Man, incidentally. But such trashy books offer the best metaphor for what I see. An alien predator destroys its host and occupies the shell of the body while a few voices urge society to pay heed to an impending, incomprehensible but irreversible disaster. This entry was posted in Books, Culture, Design, Media and tagged books, culture, literature, media, penny woolcock, plato's republic, publishing, roundhouse, utopia. Bookmark the permalink.